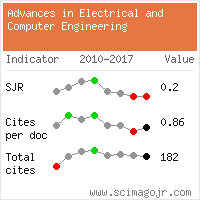 MAC-Level Communication Time Modeling and Analysis for Real-Time WSNs, STANGACIU, V., MICEA, M., CRETU, V.
Real-Time Scheduling for Preventing Information Leakage with Preemption Overheads, BAEK, H., LEE, J., LEE, J., KIM, P., KANG, B. B. Correction Impulse Method for Turbo Decoding over Middleton Class-A Impulsive Noise, TRIFINA, L., TARNICERIU, D., ANDREI, M.
KIZILOLUK, S. , ALATAS, B. In recent years, classification rules mining has been one of the most important data mining tasks. In this study, one of the newest social-based metaheuristic methods, Parliamentary Optimization Algorithm (POA), is firstly used for automatically mining of comprehensible and accurate classification rules within datasets which have numerical attributes. Four different numerical datasets have been selected from UCI data warehouse and classification rules of high quality have been obtained. Furthermore, the results obtained from designed POA have been compared with the results obtained from four different popular classification rules mining algorithms used in WEKA. Although POA is very new and no applications in complex data mining problems have been performed, the results seem promising. The used objective function is very flexible and many different objectives can easily be added to. The intervals of the numerical attributes in the rules have been automatically found without any a priori process, as done in other classification rules mining algorithms, which causes the modification of datasets. 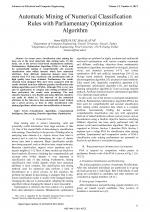 Web Pages Classification with Parliamentary Optimization Algorithm, Kiziloluk, Soner, Ozer, Ahmet Bedri, International Journal of Software Engineering and Knowledge Engineering, ISSN 0218-1940, Issue 03, Volume 27, 2017. SM-RuleMiner: Spider monkey based rule miner using novel fitness function for diabetes classification, Cheruku, Ramalingaswamy, Edla, Damodar Reddy, Kuppili, Venkatanareshbabu, Computers in Biology and Medicine, ISSN 0010-4825, Issue , 2017. ANT_FDCSM: A novel fuzzy rule miner derived from ant colony meta-heuristic for diagnosis of diabetic patients, Anuradha, , Singh, Akansha, Gupta, Gaurav, Journal of Intelligent & Fuzzy Systems, ISSN 1064-1246, Issue 1, Volume 36, 2019. Website conception, design and maintenance by Eugen COCA. Content updated on 28 Feb 2019. Site engine updated on 28 Feb 2019. This page was generated on the server in 0.029 seconds and loaded in your browser in > seconds.